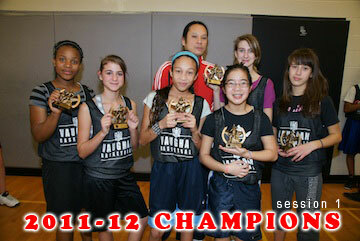 VBA is now offering a Girls House League program! This program allows for girls to learn & compete to their full potential in a supportive environment where they can feel comfortable & have fun! Providing girls with an opportunity to play their hardest in a positive environment gives them the chance to build their confidence, improve their fitness, socialize & have fun. They will be able to build on the critical life skills of self-esteem, discipline, commitment, teamwork, respect and sportsmanship skills that will help them both on & off the court. Girls House League is a 12 week (8 weeks for Spring session only) program for players between the ages of 8 to 14. Players will be taught the fundamentals of the game while having fun! Our Coaches are committed to developing individual skills, introducing concepts of team play and improving the over-all fitness levels of all players. Teams are created according to age and skill level. Players take part in weekly skills development and games, and playing time is regulated so that every participant will receive equal playing time. A participation medal at the end of the season. Each team will also have a chance to win a championship trophy.